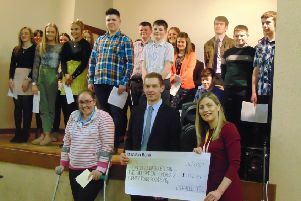 As 2018 draws to an end, Randalstown YFC has been busier than ever with competitions, dinner dances and club meetings. September also saw Randalstown YFC welcoming 21 new members to the club and taking a trip out to We Are Vertigo in Belfast. October saw members competing in public speaking and floral art competitions. Congratulations to Gemma Dickey who was placed first in Northern Ireland for impromptu public speaking. Ellen Smyth, Emma Mills and Ryan Bonar have progressed to Balmoral Show 2019 for the floral art final, make sure to check out the club’s budding young florists at the show. October also saw the Co Antrim YFC annual dinner dance where Randalstown YFC picked up 11 prizes on the night, including most efficient club in Co Antrim for the second consecutive year. Members all had a great night celebrating their achievements over the past year. Club members attending the Jungle NI Fright Night, thankfully everyone made it home without any panic attacks. Friday, November 3rd saw Randalstown YFC’s annual dinner dance which was held in the Ross Park Hotel. The club welcomed Andrew Patton as a guest speaker and to follow the prize giving everyone was entertained by a magician. On the night Robert Smyth collected the award for best over 16 member, Aaron McNeilly collected the award for best under 16 member, Gemma McNeilly collected the award for most outgoing new member and Ellen Smyth collected the award for most enthusiastic member. The club is planning to run a children’s Christmas party on Saturday, December 8th and a Beetle Drive on Friday, March 8th 2019 (more details can be found on Facebook). These events are open to all members of the community so remember it’s not all about welly boots and tractors.